Two months have flown by since A Link Between Worlds was released outside Japan. With Link’s portrait-themed adventure now behind us, anticipating the next major Zelda game on the horizon is the new order of business. Little is officially known about this elusive title, set to be the first original entry in the series to come out on the Wii U (not counting the Dynasty Warriors spin-off, Hyrule Warriors, that is). What we do know, however, is that the game will have over 25 years of Zelda history to draw inspiration from. A Link Between Worlds is one chapter of this history that could strongly influence Zelda’s first full-fledged Wii U installment. After all, what better way is there to judge the direction Nintendo wants to take the series than by looking at its freshly minted 3DS game? 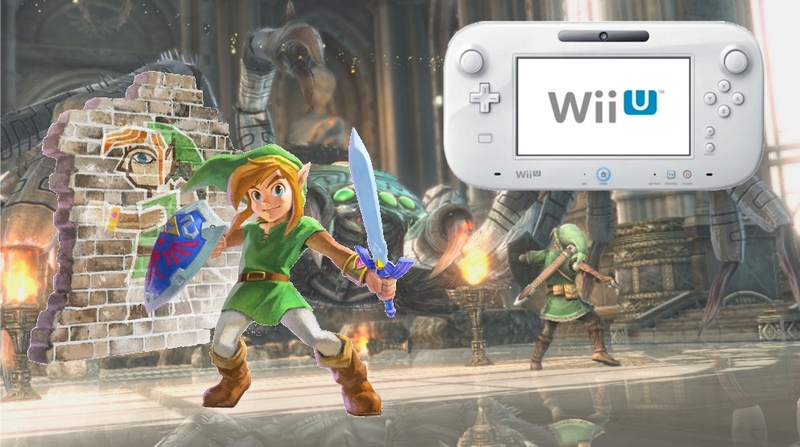 Not only does it represent the Zelda team’s most recent work, but both it and Zelda Wii U likely shared development time at one point or another. It’s to be expected that the two Zelda development teams bounced ideas between the two projects. The question is: what design choices should Zelda Wii U borrow from A Link Between Worlds? What aspects of the game can be easily carried over to a 3D console Zelda, and represent trends the series as a whole should continue to roll with? Hit the jump to find out. Many newer Zelda games open with drawn-out dumping grounds of narrative exposition. Filler pads the early hours of Twilight Princess, from the errand running in Ordon Village to the lengthy wolf sequences that force us out of Link’s boots. Although not nearly as protracted, Skyward Sword took its own sweet time before giving players free reign to enjoy its puzzle-packed dungeons. Of course, every game looking to tell a compelling narrative needs time to introduce key characters and set its plot in motion. When this becomes an obstacle to gameplay, however, it’s time for the writers to get to the point. This is where A Link Between Worlds was a refreshing change of pace. 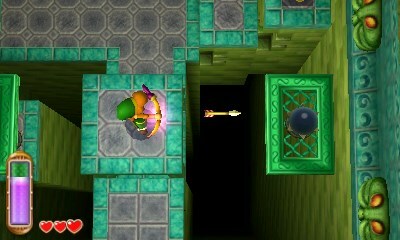 It sent Link off on his quest quickly, giving him a sword to swing and a mini-dungeon to run through right off the bat. He also encounters most essential characters within the first half hour, including the nefarious Yuga and the eccentric shopkeeper, Ravio. This brisk pace succeeded by putting the main grit of the gameplay front and center. The opening felt like a natural part of the game, rather than a forced tutorial. Now it’s fair to point out that A Link Between Worlds‘ opening scenes aren’t perfect. Characters like Seres, Impa and Princess Zelda felt glanced over, and the beginning largely lacked defining set-piece moments. 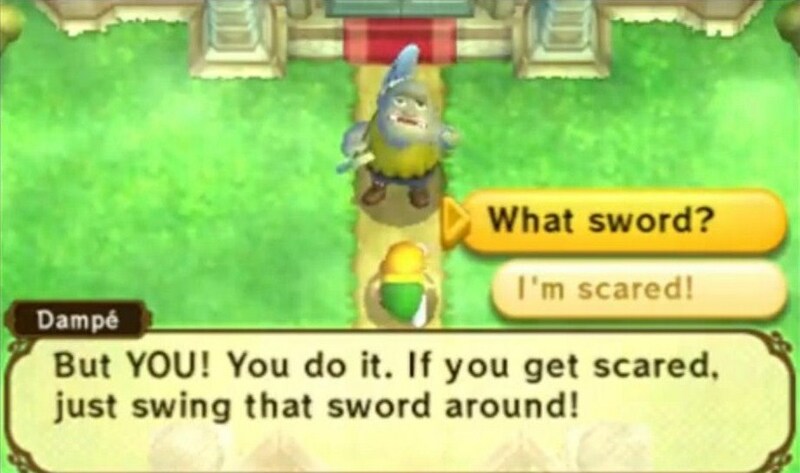 As a top-down handheld title, A Link Between Worlds could get away with this. Future console Zeldas, however, should stick with cinematic openings, as long as the beginning isn’t dragged out to an unnatural pace, because modern Zelda games need to take a few steps closer back to the pick-up-and-play mentality of earlier Zelda titles. For me, the main strength of the Zelda series has always been the colorful worlds it creates. I speak not only of their often dynamic visual appearance, but also the energetic personality of the people living in them. A Link Between Worlds delivers on both fronts. Running through its vibrant environments and meeting its lively characters is a joy. Even common baddies like the obnoxiously aggressive Hinox giants and perky Snap Dragons are full of energy. To me, A Link Between Worlds has the perfect visual style for a Zelda game. There is no gimmick to it; neither the cel-shaded toon-style of The Wind Waker, the brooding realism of Twilight Princess or Skyward Sword‘s impressionistic backgrounds. It has a timeless look that is all its own. We need only look at the concept art pictured above to get a sense of how awesome it would look translated into a HD third-person adventure. No matter what kind of art style Zelda Wii U ends up adopting, having a bright range of color similar to A Link Between Worlds should be a priority. Nintendo games often look best when using minimalist art styles, and energetic graphics will help Zelda Wii U stand out in the sea of gray and brown that dominates many blockbuster games these days. This doesn’t necessarily mean the series needs to kick realism to the curve, but realism doesn’t need to be muted. One of A Link Between Worlds‘ main innovations is its use of a centralized shop where Link obtains his familiar equipment. A more ever-present feature related to this, however, is the recharging Energy Gauge that determines how much Link can use his items. I personally loved this feature. It’s perfectly tied into the gameplay’s pace, even more so than Skyward Sword‘s stamina meter. It allowed for easy experimentation, while requiring an extra level of strategy conserving the meter’s juice. Logically, I admit it doesn’t make much sense for Link’s supply of arrows and bombs to recharge over time. But hey, Hyrule is a magical realm. Nintendo should feel free to throw realism to the wind if it makes for good gameplay. Besides, conserving resources never felt like a pressing feature in the series to begin with. Item drops were usually readily available when needed, and restocking at a store was always an inexpensive option. If anything, having to trek back to certain locations to refill a quiver or bomb bag was more of an annoyance than anything else. The Energy Gauge eliminates this micro-management, while still preventing players from spamming items without limit. It goes without saying that exploration played a large part in The Legend of Zelda. Its 8-bit world was up to early gamers to discover on their own, without the aid of an overarching narrative directing them from dungeon to dungeon. As Zelda games became increasingly linear and story-oriented, however, exploration took a backseat to straightforward plot progression. Zelda stories became more dynamic and interesting because of this, but after a while it was time for truly open-ended Zelda adventuring to make a comeback. Thankfully, A Link Between Worlds was ready to answer the call. Arguably, the key ingredient to A Link Between Worlds‘ non-linear framework is its open overworld. 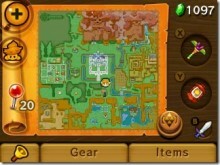 Much of Hyrule and Lorule can be explored at the player’s discretion once Link clears certain milestones on his quest. Dungeons, at least in the latter portion of the game, can be completed in any order the player wants, and the open landscape in between them offers plenty of secrets to discover and hordes of enemies to battle. Of course, many recent Zelda games have offered large environments for Link to run around. 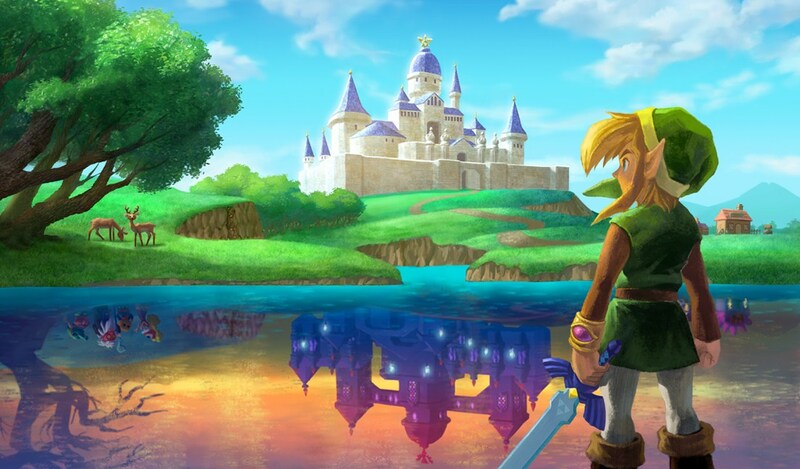 A Link Between Worlds, however, actually gives compelling reasons to go off the main track. Treasure chests are scattered across its forests and fields, often in hard-to-reach areas. Optional treasure hunting chambers meanwhile, offer fun diversions for ardent puzzle-solvers. A Link Between Worlds offers some of the best payoff for thorough exploration of any game in the series. Ravio’s shop-full of expensive equipment provides a purpose for the hundreds of rupees Link picks up on his quest, prodding players to search every nook and cranny for the multicolored gems. Meanwhile, the various stat upgrades hidden in dungeons, including the Hylian Shield, Master Ores, Blue and Red Mails and the Stamina Scroll, reward emptying every chest. 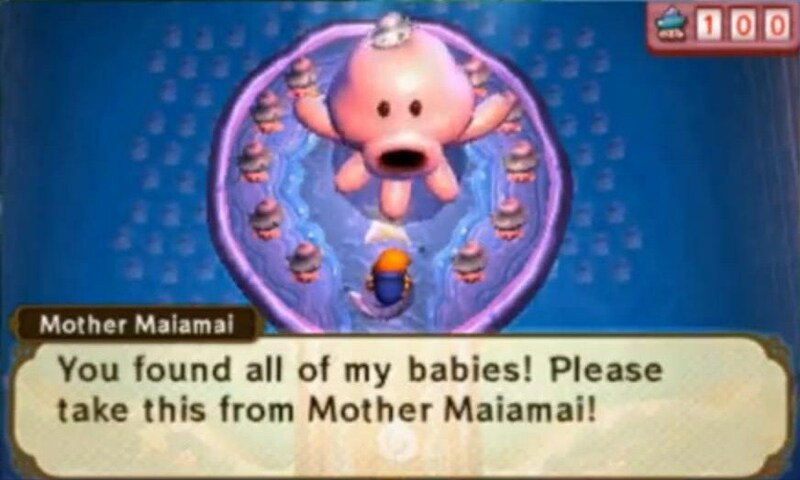 The expansive Mother Maiamai sidequest, which tasks Link with gathering all 100 Lost Maiamais spread across the game’s dual overworlds, offers even greater rewards. Every 10 of the squid babies Link returns to their mother grants him an upgrade to his gear. As the quest goes on, Link gradually amasses an unstoppable arsenal. Standout upgraded items include the Nice Fire Rod, which incinerates everything in its path, and the Nice Tornado Rod, which unleashes swirling gusts of wind . After all Lost Maiamais are found, Link is rewarded with the Great Spin Attack, a room-clearing move that devastates all enemies within its screen-filling range. It was the perfect motivation for seeing this massive sidequest to completion. I personally scoured the overworld for these little squid buggers, eager to reap the justly deserved rewards for finding each one. Tantalizing rewards give players a reason to take world and dungeon exploration seriously. Zelda Wii U could only benefit from a similar philosophy that makes pumping extra time and effort into conquering the game a gratifying experience. Each Zelda game has built upon the structure of its predecessor to some degree. It’s a constant evolution that sees the best concepts of the past tweaked and reinterpreted as developers try their best to balance originality with familiarity. Their task isn’t to recreate Zelda’s identity with each new game, but to repackage its best components with fresh ideas. Despite being a top-down handheld game, heavily inspired by the 16-bit era of over two decades ago, A Link Between Worlds has more than a few pages for Zelda Wii U to borrow from.